"FunLimón has been instrumental in creating the link between Rancho Santana guests and those who live locally in the surrounding communities. It has become a place for people to bond on many different levels…From working out together in the gym and attending athletic events and community fairs, to volunteering in the class room and more. FunLimón has helped us introduce our guests and homeowners to the local community and culture, greatly enhancing their visits to the area.In addition, FunLimón's new vocational training campus will help fill the void of trained skilled labor in the area and we look forward to supporting the program as it grows. We are always eager to employ workers who come directly from our local communities and we hope this program will help increase the number of local workers at Rancho Santana. Overall, FunLimón has become the perfect place for community centric activities that draw both people from the community and guests alike." Yenifer Guzman. She is 22 years old from Las Salinas. She is taking English classes at a university in Rivas and wants to work in tourism in the future. She currently works at FunLimón as a fitness trainer. 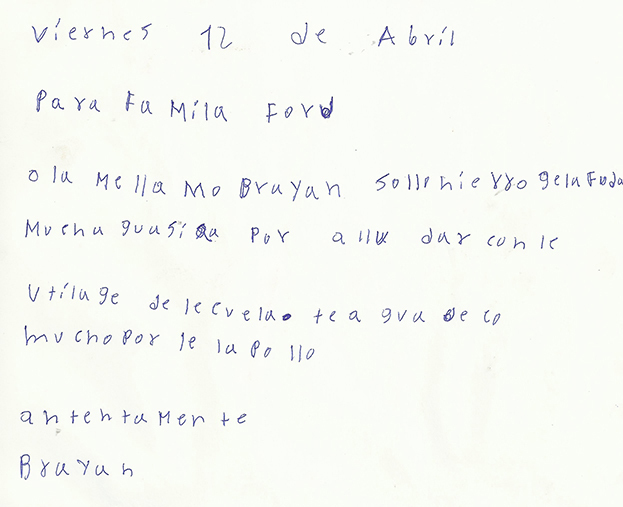 Hello, I am Yenifer Guzman, one of the Ford Family Foundation's scholarship students. I am writing this letter to thank you for the help you have given me. This scholarship will help me move forward and have a better future. Now, with your help, I am studying English. I hope to not fail and always move forward. Thank you very much for all of the support that you give to all. 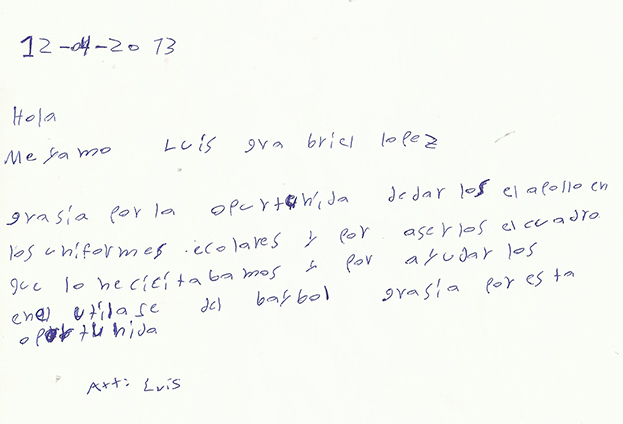 Luis Lopez. He is 12 years old and loves to play soccer and baseball. He hopes to become a chauffeur/taxi driver (not joking). Hello, my name is Luis Gabriel Lopez. Thank you for helping us with the school uniforms. Thank you for the school supplies and for the baseball equipment. Thank you for the many opportunities you have allowed me. Jonathan Gazo. He is 14 and wants to be a security guard. He is on the FunLimón baseball team. 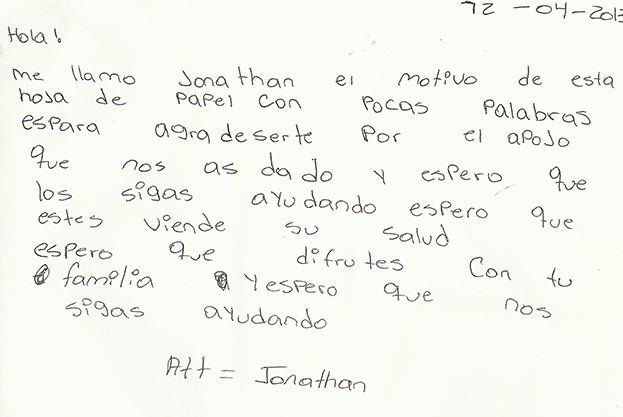 My name is Jonathan. 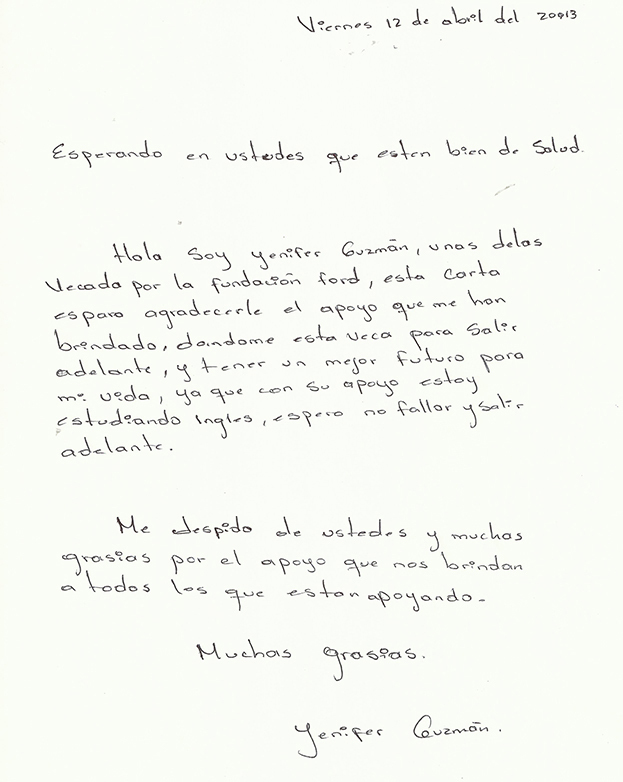 The reason I am writing this letter, in a few words, is to thank you for the support that you have given us. I hope that you continue to help us and I also hope that you are in good health. I hope that you are enjoying your time with your family and I hope that you continue supporting us. Jen Alezandro Zapata. Jen is 11 years old and loves to play soccer. He studies English here at FunLimón. When Jen grows up, he wants to be a gardener. Hello, my name is Jen. I thank you for the support you have given us with the uniforms and the school supplies. Also, thank you for the soccer field. Thank your support. I thank you very much. Oscar Zapata. He is 15 years old and wants to be a tourist guide when he grows up. He plays on the FunLimón baseball team and takes English classes. 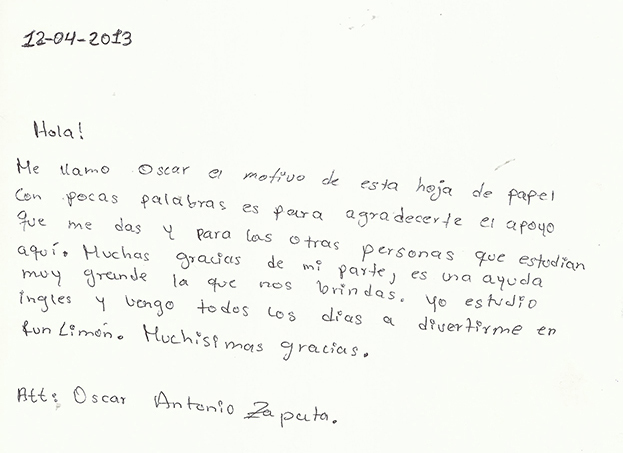 My name is Oscar and the motive of this letter is to thank you for the support that you have given me and all of the other people that study here. I want to give you a personal thanks. It is a great help. I study English here and I come here everyday to have fun in FunLimón. Thank you so much. 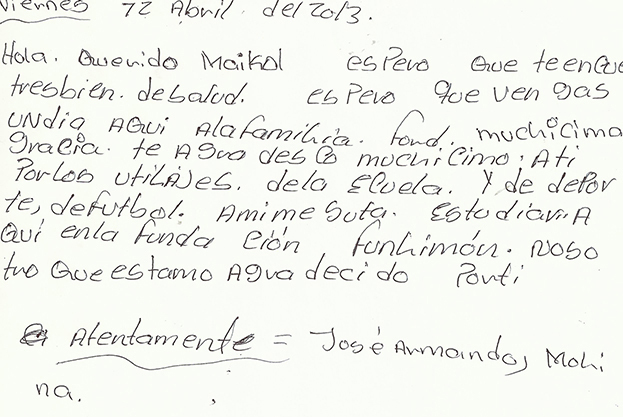 Jose Armando Molina. He is 11 years old and loves to play soccer and baseball. He wants to be a business administrator when he grows up. Hello my dear Michael. I hope you are in good health. I hope you come back here one of these days to the Ford Family (Foundation). Thank you so much, I really appreciate all of your support with the school supplies and soccer equipment. I love studying here in the foundation, FunLimón. We are very thankful for you. Bryan Smith. He is 12 years old and wants to be a gardener when he grows up. Hello, my name is Bryan. Thank you for all the support and help with the school supplies. I really appreciate your help. 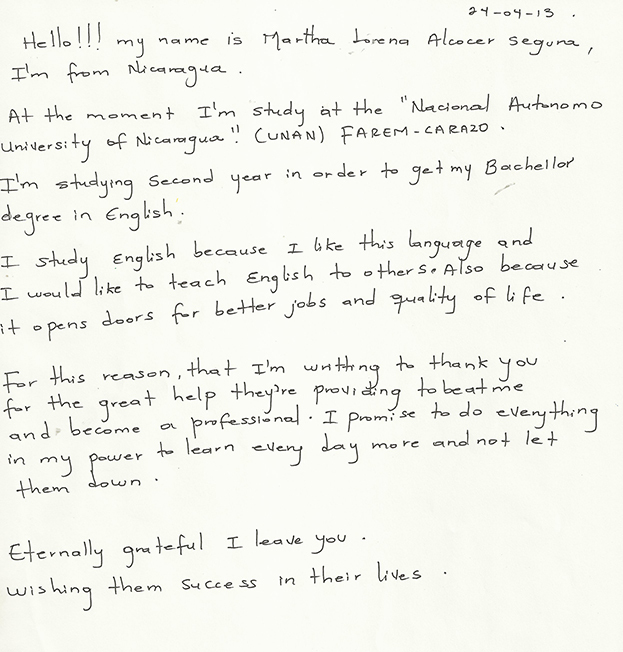 Martha is 21 years old and studying to be an English teacher. She works at the local kids library in the afternoons. Hello! My name is Martha Lorena Alcocer Seguna. I'm from Nicaragua. At the moment I'm studying at the Nacional Autonomo University of Nicaragua (UNAN) Farem-Carazo. I'm in my second year of study to get my Bachelor's degree in English. I am studying English because I like the language and because I would like to teach English to others. It also opens doors for better jobs and quality of life. For this reason, I am writing to you to thank you for the great help you have provided me to become a professional. I promise to do everything in my power to learn more every day and to not let you down. Eternally grateful, I leave you. Wishing you a lifetime of success. Rene Castillo is 18 years old and has a 93% average, one of the best in his class. 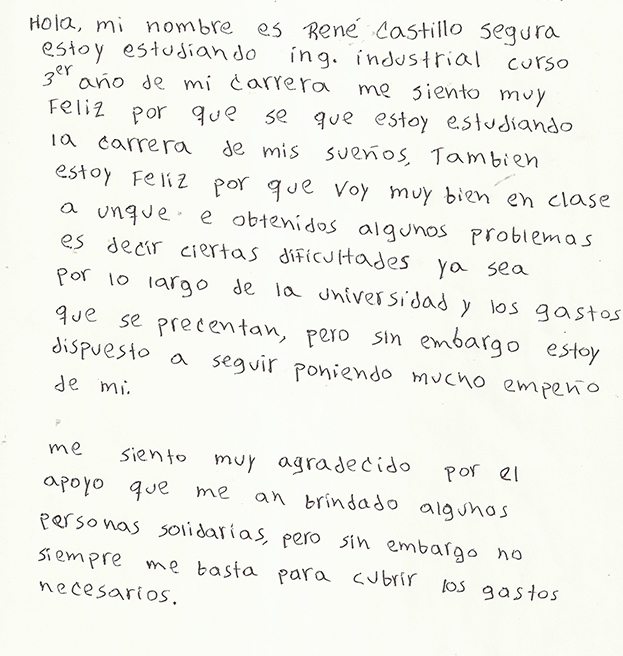 My name is Rene Castillo Segura and I am in my third year of studies to become an industrial engineer. I am very happy with my career choice, it is the career of my dreams. I am also happy because I am doing well, despite many obstacles that I had to overcome. I am eager to keep moving forward in my studies and in my career. I am very grateful for all the help that has been given to me.